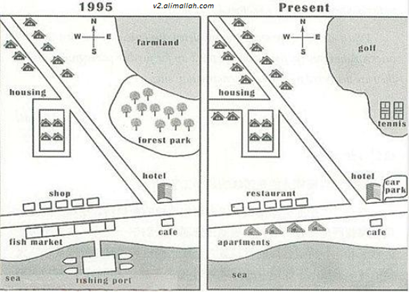 The given maps illustrate one of Turkish town called Safranbolu in 1995 and present. Overall, in both years hotel and cafe were unchanged. Since 1995, the area witnessed dramatic changes. Fish related market and port are totally removed. It is clear that so many new buildings have added. The number of housing is significantly increased. More specifically, 2 houses are added next to housing are which is located in the middle of the map. The fish market is converted to apartments as well. In the present, The car park is built next to the hotel which is also across the cafe. Farmland, forest park, shop and fish market have demolished. More specifically, the farmland which located in the Nort East of the map turned into a golf field. Size of the golf field is greater than the size of farmland due to an additional tennis building. It can be seen that the map of Safranbolu significantly changed except for the area of the hotel and the cafe.